Every day, enormous amounts of information are generated from all sectors, whether it be business, education, the scientific community, the World Wide Web (WWW), or one of many readily available off-line and online data sources. From all of this, which represents a sizable repository of data and information, it is possible to generate worthwhile and usable knowledge. 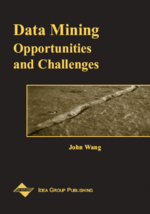 As a result, the field of Data Mining (DM) and knowledge discovery in databases (KDD) has grown in leaps and bounds and has shown great potential for the future (Han & Kamber, 2001). The purpose of this chapter is to survey many of the critical and future trends in the field of DM, with a focus on those which are thought to have the most promise and applicability to future DM applications.